Smooth running family owned retail skateboard shop with strong online presence for sale. 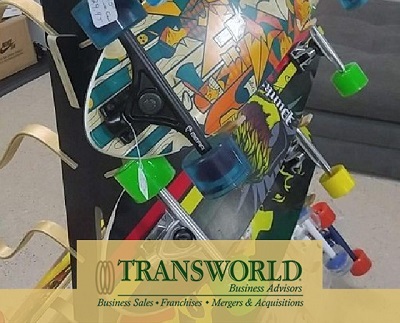 They provide quality and friendly service while matching shoppers with the ideal boards featuring hard to find skateboards, long boards, scooters and accessories. They offer private lessons, community events and possess a strong and loyal customer base. Hard to get vendor relationships in place for products like apparel, footwear, & specialty T-shirts. Owner operator opportunity and owner benefit based on W-2 offset. Favorable rental terms. Brands carried: Volcom, Rvca, Primitive, Adidas, Nike sb, Diamond, DC and many more.